The reference range varies depending on the methodology used. Normal ranges should be validated by individual clinical laboratories. Hematocrit is the fraction of whole blood composed of red blood cells. Hematocrit rises with an increase in the number of red blood cells or a decrease in the plasma volume. Conversely, hematocrit decreases when plasma volume increases or in states of decreased erythropoiesis or increased red cell destruction or loss. Hematocrit may be measured directly by centrifugation or indirectly by automated methods. Hematocrit may indicate that a patient has anemia, erythrocytosis, or changes in plasma volume. Hematocrit may be used as a cutoff to determine transfusion requirements. Following hematocrit as a marker over time may help determine response to treatment. Increased spurious results may be seen by centrifugation methods when plasma trapping or hyponatremia exists,  or by automated methods when hyperglycemia, high white blood cell counts, giant platelets, or cryoglobulins are present. 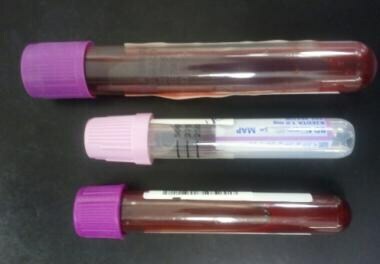 Decreased spurious results may be seen by centrifugation methods when excess EDTA, hypernatremia, or in vitro hemolysis is present, or by automated methods when clotting, agglutination, hemolysis, or RBC microcytosis is evident. Hematocrit may be decreased in pregnancy secondary to increased plasma volumes. Reference ranges for populations residing in high-altitude areas may be increased secondary to increased oxygen carrying capacities at higher elevations. Thorson CM, Ryan ML, Van Haren RM, Pereira R, Olloqui J, Otero CA, et al. Change in hematocrit during trauma assessment predicts bleeding even with ongoing fluid resuscitation. Am Surg. 2013 Apr. 79(4):398-406. [Medline]. Miri-Dashe T, Osawe S, Daniel MT, Choji RP, Mamman I, Deme K, et al. Comprehensive reference ranges for hematology and clinical chemistry laboratory parameters derived from normal Nigerian adults. PLoS One. 2014 May. 9(5):e93919. [Medline]. Chlíbková D, Knechtle B, Rosemann T, Zákovská A, Tomášková I, Shortall M, et al. Changes in foot volume, body composition, and hydration status in male and female 24-hour ultra-mountain bikers. J Int Soc Sports Nutr. 2014 Mar 24. 11(1):12. [Medline]. [Full Text]. Liak C, Fitzpatrick M. Coagulability in obstructive sleep apnea. Can Respir J. 2011 Nov-Dec. 18(6):338-48. [Medline]. [Full Text]. Jimenez C, Melin B, Koulmann N, Allevard AM, Launay JC, Savourey G. Plasma volume changes during and after acute variations of body hydration level in humans. Eur J Appl Physiol Occup Physiol. 1999 Jun. 80(1):1-8. [Medline]. Bilgrami S, Greenberg BR. Polycythemia rubra vera. Semin Oncol. 1995 Aug. 22(4):307-26. [Medline]. Conrad ME. Walker HK, Hall WD, Hurst JW, editors. Clinical Methods: The History, Physical, and Laboratory Examinations. 3rd ed. Boston: Butterworths; 1990. 147. Hébert PC, Yetisir E, Martin C, Blajchman MA, Wells G, Marshall J. Is a low transfusion threshold safe in critically ill patients with cardiovascular diseases?. Crit Care Med. 2001 Feb. 29(2):227-34. [Medline]. Matoth Y, Zaizov R, Varsano I. Postnatal changes in some red cell parameters. Acta Paediatr Scand. 1971 May. 60(3):317-23. [Medline]. Sarma PR. Walker HK, Hall WD, Hurst JW. Clinical Methods: The History, Physical, and Laboratory Examinations. 3rd ed. Boston: Butterworths; 1990. 152. Vajpayee N, Graham SS, Bem S. Basic examination of Blood and Bone Marrow. MPherson RA, et al, eds. Henry’s Clinical Diagnosis and Management by Laboratory Medicine. 22nd ed. Elsevier Saunders: Philadephia PA; 2011. 512-3. News Empagliflozin Survival Benefit in Diabetes: Is it Plasma Volume Drop?